Sometime during the day of Friday, November 19, 2016, the cast and crew of Hamilton, Lin-Manuel Miranda’s prize-winning Broadway musical, were informed that U.S. Vice-President-Elect Mike Pence and his family would be in the audience that night. And so it was that the stage was set for “a play within a play.” As Pence entered the Richard Rogers Theatre with hundreds of others, he was greeted with a mix of boos and applause. As the musical progressed, and specific lines and songs were performed, it was as if Miranda had written them explicitly for this post-election, political-moment-in-time. Not surprisingly, then, after King George III (played by Rory O’Malley) sang “When your people say they hate you / Don’t come crawling back to me,” the cheering and shouting was so intense that he had to ask for quiet so the play could resume. We, sir, are the diverse America who are alarmed and anxious that your new administration will not protect us, our planet, our children, our parents . . . We truly hope that this show has inspired you to uphold our American values and work on behalf of all of us. Newspapers, online media, and critics have dubbed this “the Hamilton episode” because this performance-and-post-performance event not only marked a significant moment in American political discourse, it went beyond “another day in the life” of American musical theater: the Hamilton episode “troubled”—literally and figuratively—many ways in which art-making, politics, race, gender, history, and other aspects of life are always inseparable, and the ways in which art-making and “art-taking” can perform peaceful and effective social protest. The Hamilton episode touched on LGBTQ issues, which were shamefully under-discussed during the [recent U.S. election] campaign and remain so now. It touched on immigration; on race; on the impact and value of protest speech; on the president-elect’s temperament; on his demands for opponents to capitulate; on his disdain for First Amendment freedoms (his quartet of Hamilton tweets was consistent with his post-election attacks on public protestors and on the New York Times); and on the worries of several large populations that the Trump administration will demonize them and make them less safe. 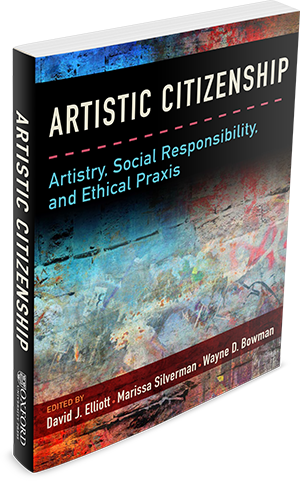 This episode also raises questions about the old 19th-century notion of “art for art’s sake” and the actuality of “art for people’s sake”—i.e., art making for the positive transformation of one’s own and others’ personhood and social communities. When a person creates a piece of music, or writes a poem, s/he is not doing it for the benefit of another piece of music, or another poem—i.e., art for art’s sake—but for the benefit of people. People like President-Elect Donald Trump—who demanded an apology from the cast of Hamilton (so much for “free speech” in Trump’s America)—and those who consider social-participatory and applied art-making, or artivism, a threat to their comfortable beliefs, probably do not understand the potency of the arts. The arts can unsettle us, move us to reconsider our beliefs and motivations, and question our worlds. The arts are not “safe places” and likely should not be, especially now. The real work of a “work of art” is not simply to show, but to tell. It’s essential that we (amateurs and professionals) put our artistic endeavors to work for the safety and well-being of people who are under attack. It’s essential that we engage actively in Artistic Citizenship. The shelter residents are asked to write down their thoughts about the concerts on index cards. Yet another wrote: EVER SiNCE MY PARENTS passed, I can’t gEt my life together. BASKETball AND MUSIC has helped ME, but I still don’t KNOW where MY life is going. THANK YOU! I often think to myself when people ask this: Is this going to work? Here was period (Renaissance/Baroque motets) music being sung in German. So, I thought: No way. This is not going to work. But I was wrong. And it really made me think that it doesn’t really matter what music it is, or what people’s prior experience has been, people gravitate towards all music. This young man, in his early 20s, did not have any prior “formal” experience with making music, and he certainly did not have any experience speaking German or reading music fluently, but he just looked over the director’s shoulder and did his best on one song, and sat down when finished. And he felt really good about himself. And satisfied. It was truly amazing that he felt so much a part of the concert experience that he had the desire to be even more connected to the music in this way. In addition to this kind of participatory music making, Hall-Tompkins finds that music listening has a lasting, therapeutic component. To bring top emerging and established professional musicians together in order to share the inspirational, therapeutic, and uplifting power of music with New York City’s disenfranchised homeless shelter population. I believe a shelter exists to provide not only physical but emotional and spiritual support to those who, for whatever reason, have lost the foundation of their homes and communities. I believe that music reaches the core of our being and can play a vital role in nourishing hope, love and strength, particularly when performed at an extremely high artistic level and in a friendly, relaxed setting. More recently, the Music Kitchen has expanded its reach. It opened a new series in Los Angeles on December 4, 2014. The Los Angeles Branch of the Music Kitchen is presented in partnership with LAHSA, Los Angeles Homeless Services Authority.